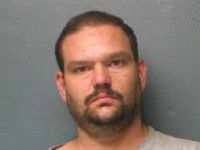 A 37-year-old Independence Missouri man has been arrested after allegedly admitting that he molested two young girls. Police say the case against David Duree began when a 9-year-old girl told her father that she was being molested at a friend's house by him. According to this article, when questioned by police Duree admitted to not only molesting the 9-year-old but also another girl who was only 10. He also told them that he would have continued to molest children had he not been caught. On his above MySpace profile, Duree claims to be married with two young children.